Perennial herb from rhizome; stems erect, 30-100 cm tall, simple or branched, 4-angled, spreading-hairy on the angles, some hairs glandular. Opposite, narrowly egg-shaped, 2-12 cm long, 1.5-8 cm wide, coarsely blunt-toothed, sparsely-hairy; stalked; somewhat reduced and shorter-stalked upward. Inflorescence of several to many flowers in open terminal clusters, often with additional flower clusters in leaf axils, subtended by slightly reduced leaves or bracts; corollas tubular, pink or pink-purple, the tube 8-13 mm long, 2-lipped, the upper lip erect, entire, the lower lip 3-lobed; calyces tubular, spreading-hairy, sometimes glandular, ring of hairs within, teeth broadly lance-triangular, shorter than the tube, spine-tipped. Moist to mesic forests, forest margins, swamps, thickets and clearings in the lowland zone; infrequent in coastal BC; N to S AK and S to CA. Shade-tolerant/intolerant, sub montane to montane, Pacific North American forb. Occurs in cool mesothermal climates on very moist to wet, nitrogen-rich soils. Occurrence decreases with increasing latitude, elevation, and continentality. 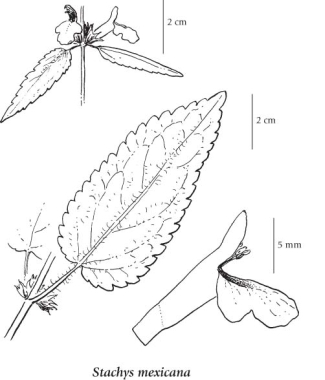 Sporadic in the herbaceous understory of broad-leaved forests on water-receiving (floodplain) sites. Commonly associated with Adiantum pedatum, Athyrium filix-femina, Circaea pacifica, Oplopanax horridus, Tiarella trifoliata, and Tolmiea menziesii. A nitrophytic species characteristic of Moder and Mull humus forms. Stachys ciliata Douglas ex Benth.